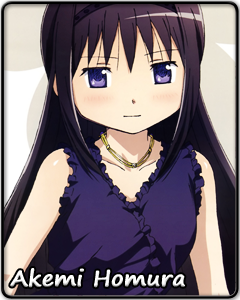 When Akemi Homura introduces herself to her new classmates, she does so by stating her name only, as if anything more was a pointless effort and acknowledging those around her could only distract her away from what is truly important. Her demeanor is cold, but she has the looks, intelligence, and athletic ability that every girl can only dream of and is a natural idol among her peers. It is no surprise that other students wish to befriend her... but forging new friendships seems to be the last thing Homura has in mind. At face value, her words and actions are devoid of any hint of kindness and compassion. However, no one can truly understand the intentions guiding her, just as none can imagine the mental and emotional scars she bears. Her eyes are an abyss, a pit deep enough to conceal even her loneliness and the longing to wrap her arms around the one who means everything to her. Her heart is shackled, too broken to register anything but new despair and pain. Tears course through her veins in place of blood, tears she cannot shed no matter how desperately she wants to. And yet Homura holds her head high, never losing sight of her mission. She will do whatever it takes to grasp onto the single miracle afforded her. She will fight and mislead and betray. Brand her friend or foe, the love and devotion Homura exemplifies are a power far surpassing both time and space.